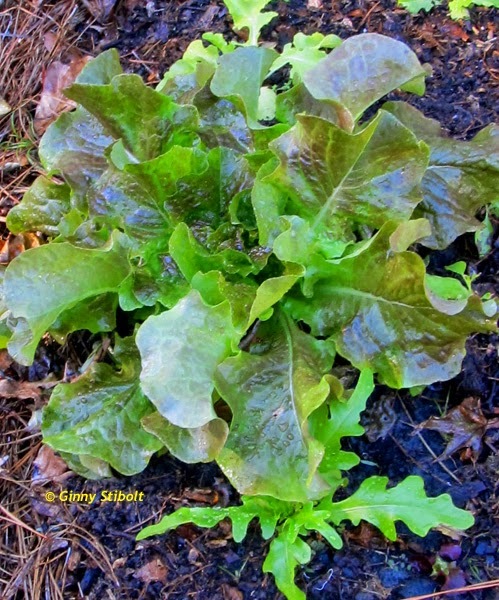 I planted an early crop of lettuce, beets, and a few white radishes at the beginning of September. 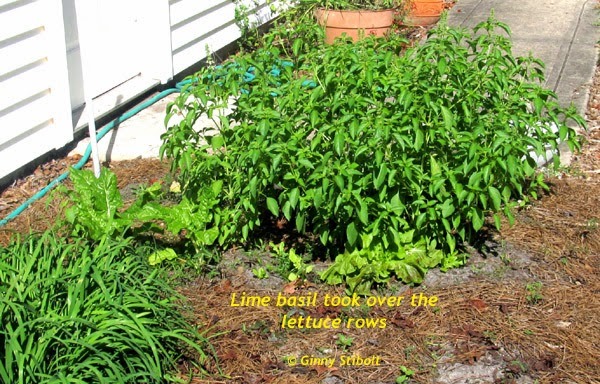 It was a little too early for the lettuces and only a few seeds germinated, but the lime basil, which had been planted in this bed the year before loved the new planting rows and volunteered there. When it became obvious that the lettuce crop would be lacking, I planted some more seed, but I left the basil in place. Well, the basil took over the whole area, as you can see in the top photo, so it was time to give the lettuce some light and room. I did not want to disturb the roots, so I cut off the stalks just above ground level and this made for an abundant harvest. I gave half of it away to two new neighbors and made pesto with the other half. In this pesto, I used equal amounts of garlic chives and basil—in addition to the onion and other ingredients. 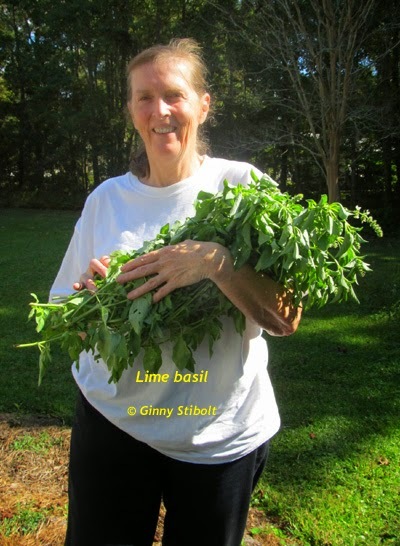 (You can see how I make pesto in my post: A field trip, A Florida native plant hero, & a pasta salad.) This time I used about a third of the pesto for a Mediterranean pasta salad and I froze the rest. Now, the lettuce and other crops have more room to grow. 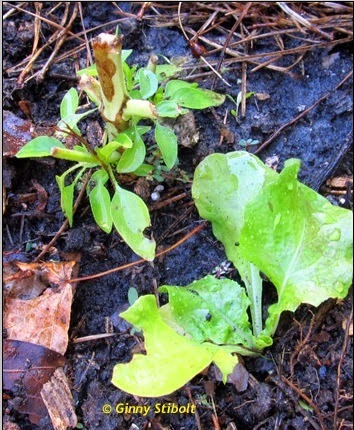 Some lettuce, like the black-seeded Simpson have been mostly harvested. A week after cutting off the lime basil, it is already sprouting, but frost will kill it in December. 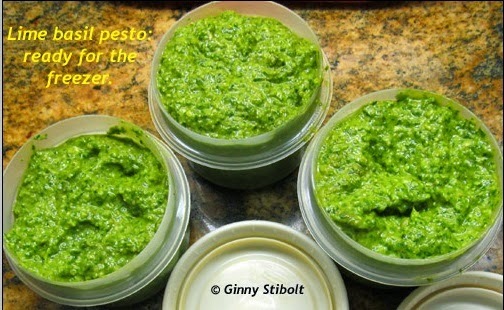 These containers of pesto will allow us to enjoy this harvest when there is no fresh basil available from the garden. One parsley plant left from last year's crop. 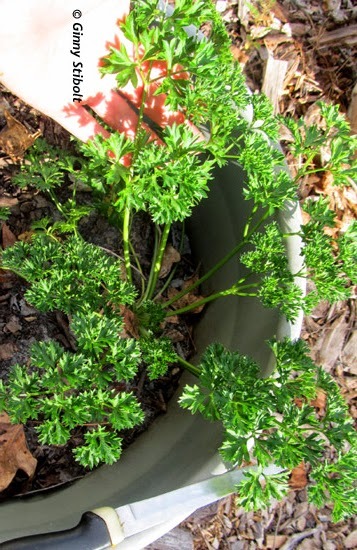 Normally, this is a biennial and takes 2 years to complete its life cycle, but here in north Florida, our season is so long that parsley sets flowers in the same season as it is planted. But this one plant that was grown in a container did not, so now I have a little fresh parsley to use early in the season. My new crop has sprouted, but it will be a couple of months before it's established enough for picking. We don't have any citrus plants in our yard, but many of our neighbors have too much. 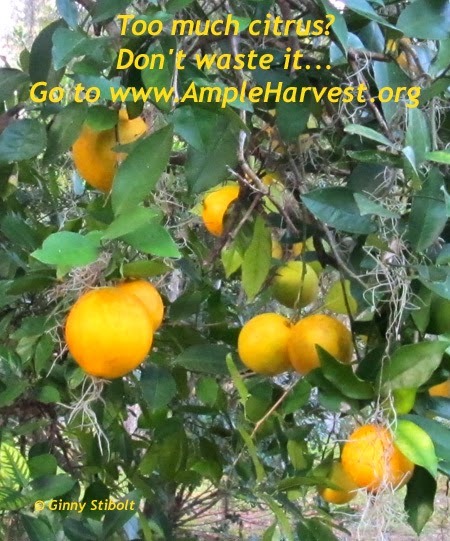 Ample Harvest is a matching service for people who have too much of a good thing with organizations that can use the surplus. How sustainable! With all the fall leaf supply, it was time to turn the compost pile. Looking from pile B toward pile A. 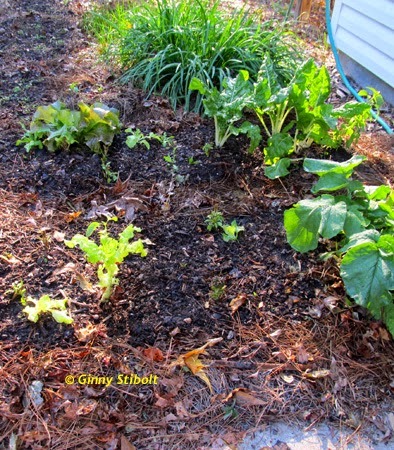 The okra stalks have not rotted in the compost pile A yet, but they will. With the abundance of fallen leaves, it was time to turn the pile. 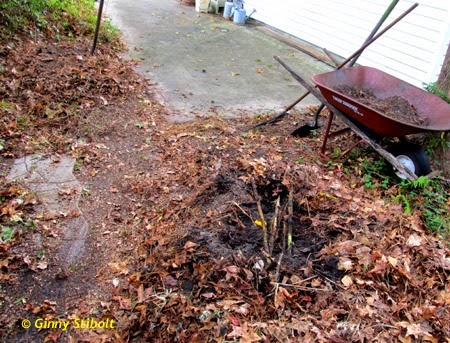 Besides, the old pile was almost cleaned out and I needed the compost from the bottom of pile A (near the shed). I scraped the rest of the compost from pile B (near the cement pad) and put it in the old wheel barrow. 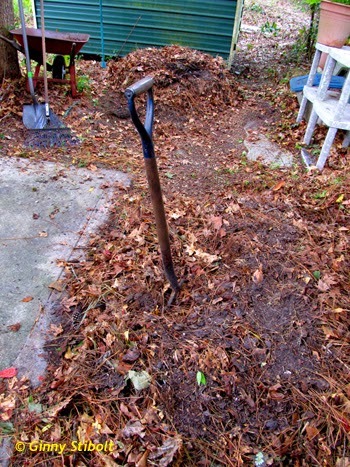 I laid in about 6" of raked leaves for the floor, and added alternating layers of 1) unfinished compost from pile A, 2) raked leaves, and 3) thin dusting of finished compost from the wheelbarrow. After the finished compost layer I poured a watering can of rain barrel water. Since the turning, I've added a layer of kitchen scraps and more leaves. I will continue to add layers of alternating green and brown materials until the end of the year and then let it rest until spring when the whole process will begin again. As expected at the bottom of the pile A, there was a good supply of moist, rich, finished compost. I'm using this compost to enrich the winter veggies beds (which you can see in the above photos), store some of it in a bin (next to the potting bench) for winter use, and use the rest of it to topdress my recently planted woody plants and others that I want to push a little more. While I never put amendments in the planting holes, a layer of compost laid outside the root ball area several times during the first couple of years after planting will entice the trees' roots to grow outward. Wide-spreading roots make plants more wind-tolerant and more drought tolerant and this is important in Florida where we have and 7-month dry season each year and tropical storms on a regular basis. Oh my! 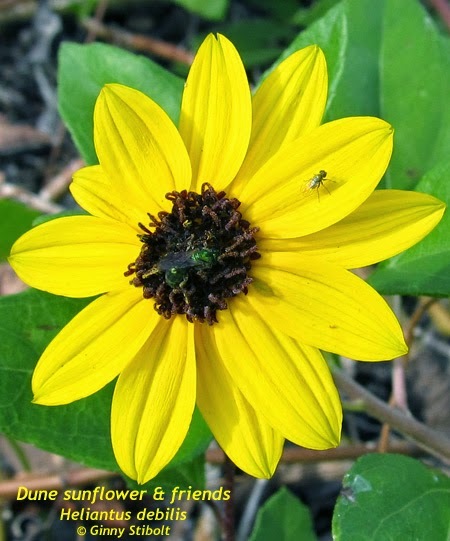 It's hard to beat the dune sunflowers for beauty and durability. This one is part of our mailbox planting. This one plant has spread across the whole bed and has lasted for 3 years. I trim it back to keep it within its boundaries and use those cuttings to make new plants. 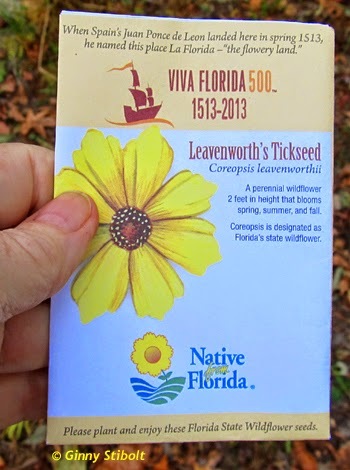 I renewed my membership in the Florida Wildflower Foundation and they sent me seeds with my new card. I've sowed these seeds in a meadow area and look forward to seeing more of these cheerful tickseed flowers in the spring. I trust that you are enjoying your fall gardening. 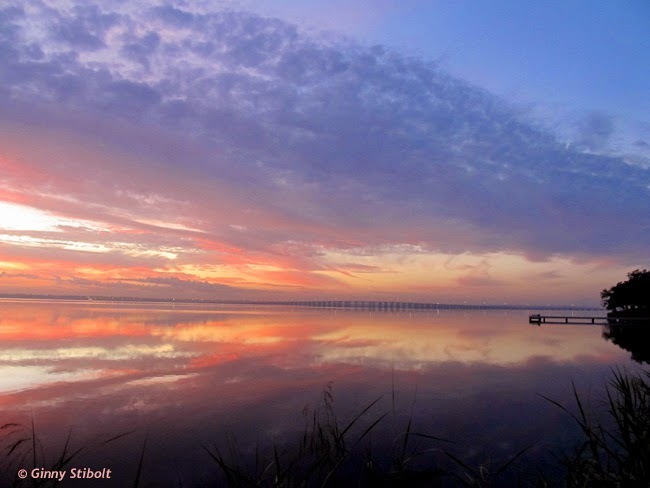 A beautiful sunrise as reflected in the St. Johns River.